This year our family has added a new tradition of sorts to our Christmas holiday season. Inspired by Laura at Pitter Patter Art, we've decided to create our own Kindness Advent, serving someone each and every day of December leading up to Christmas. Yesterday's service was taking hot chocolate and a cookie to a Salvation Army Bell Ringer. When you hear your children shrieking with delight because they saw the bell ringer they just met taking a sip of the hot chocolate they had given him and noting that they felt all warm inside from this act of service, well, it pretty much makes your day. We had picked up a peppermint hot chocolate for our unsuspecting bell ringer and it was definitely the inspiration behind this Slow Cooker Andes Mint Hot Chocolate. Who would believe you could make hot chocolate for 15 people in just five minutes? 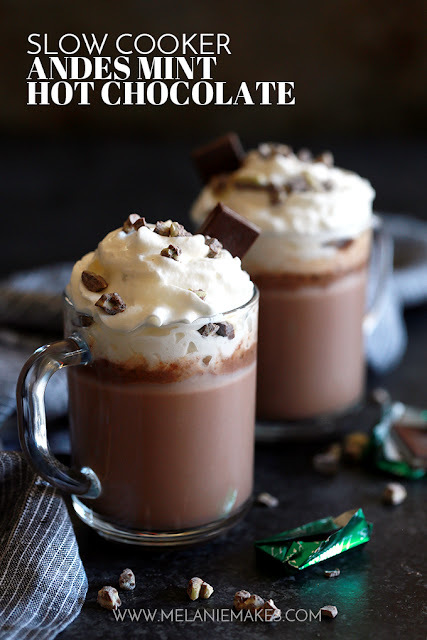 This Slow Cooker Andes Mint Hot Chocolate is here to make a believer out of any naysayer. Whole milk, heavy cream, cocoa, sugar and Andes Mints are whisked together into a velvety chocolate treat that will knock any coffeehouse's version down flat. In a six quart slow cooker, whisk together milk, heavy cream, sugar, baking cocoa and almond extract. 0 Response to "SLOW COOKER ANDES MINT HOT CHOCOLATE"